Trousers pair of non-reversible fully lined combat trousers printed with camouflage pattern of dark-brown and light-green swirls on a light khaki field. Superimposed on the pattern are black irregular 'twig' shapes. There are two deep rectangular-shaped pockets, one to each upper leg, closed by pointed flaps with green plastic buttons. To the right front is sewn a small pleated pocket, intended to carry the shell dressing. 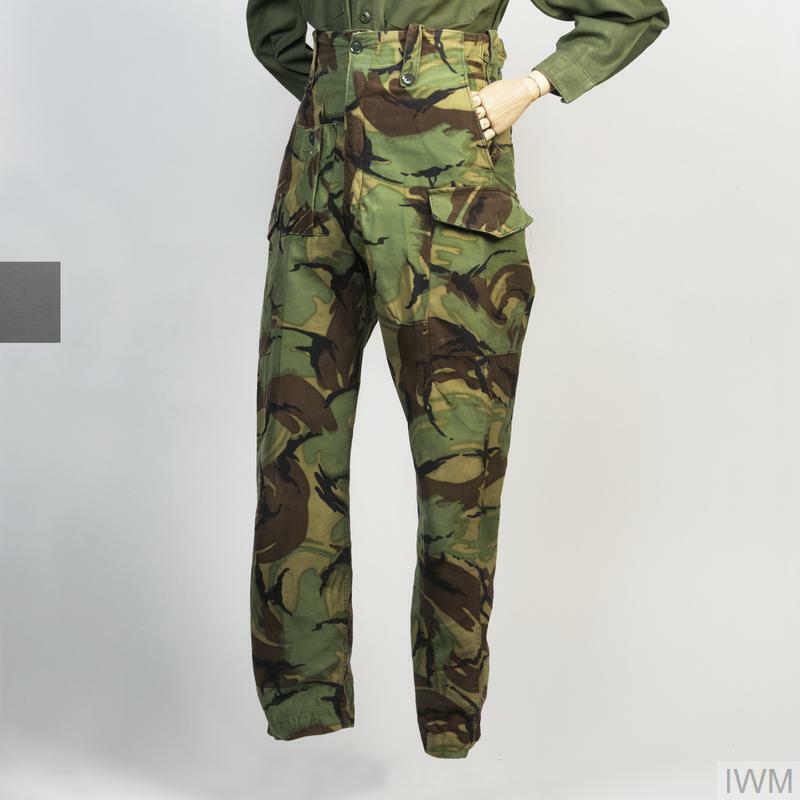 The universal issue of camouflage uniform clothing as a standard item to all ranks and branches of the British Army began with the introduction of the 1960 pattern DPM Combat Dress. 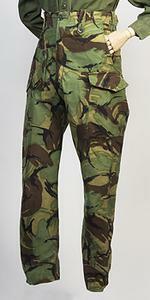 Although the DPM (Disruptive Pattern Material) camouflage was not produced until 1968 (issued in 1969), it was initially manufactured in the style of the older 1960 pattern Combat Dress - hence '1960 pattern DPM Combat Dress', and was externally recognisable by its multi-stitched collar and re-enforcing elbow patches. The 1968 pattern was however a modification of the earlier pattern and featured many progressive elements. The cloth was of better quality and the lining lighter; the collar was changed echoing the type used on Airborne Forces' Denison smocks; and the new design permitted a removable hood to be worn. Reasonably resistant to wet and windy conditions, the smock and trousers combat suit were comfortable and practical unless saturated, and then would require effort to dry them. As part of the 'layer principle' for clothing then current, the soldier was issued with a quilted waistcoat, made of dark-green padded nylon, under which he could wear the Pullover, Heavy Duty, and his Shirt, KF (khaki fatigue). Green drawers with elasticated waist and ankles were issued for wear under the trousers during the winter months in the field. Badges of rank were worn initially sewn in the conventional fashion to epaulettes for officers (or detachable rank slides), and chevrons, etc to sleeves for NCOs. By the mid-1970s removable brassards were in wide-scale use, worn by NCOs to the right arm only, often with rank badges made of a dark-green pattern and sometimes with a stylised badge of regimental pattern above. As part of the 'Combat Suit' uniform, a peaked field cap ('Combat Cap'), made of identical material, together with a detachable hood, was issued to each soldier. In warmer temperatures the wearing of the combat suit often proved uncomfortably hot, therefore some soldiers, who were able to procure a second set, often modified them by removing the linings entirely. This 'deficiency' may well have contributed to the thinking that eventually led to the adoption of the 1984 Pattern Combat Dress, which, as it turned out, was to be of an inferior quality and unpopular with those who wore it.